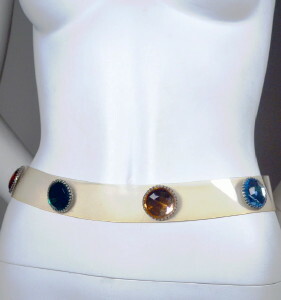 1950's vintage contour belt with large stones. Clear vinyl. Seven jewel tone 30mm faceted glass stones. Decorative silver metal prong settings. Clear hard plastic buckle. All original 1950's vintage. Put a little bling in your life! Waist - 29 to 31"
Excellent condition. Shows minor rubs & wear... inconspicuous. Pliable and completely wearable.